Tip: If you have the OneDrive desktop app, you don’t need to download a copy—you already have your OneDrive files on your computer. Any changes you make to the files in the OneDrive folder on your computer will automatically sync the next time you connect to the Internet. 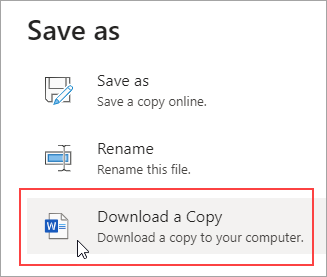 If you already know which document you want, you don’t have to open it to save a copy to your computer. Just download a copy right from OneDrive. Tip: This is also an easy way to download several documents at once. Select the document you want to download. In the OneDrive menu, click Download.